The second part of the Fallen leaves Adventure Arc clocks in at 31 pages, 1 page front cover, 1 page editorial/ToC, 1 page SRD, 1 page back cover, leaving us with 27 pages of content, so let’s take a look! On their long way towards the elven home, more sights and wonders await – like a dwarven fortune-teller specializing in lucky crystals who can provide a rather flavorful and unique form of divination that shows portents of the things to come – and then, there would be the fully depicted town of Divoky (including settlement statblocks etc.) -while the pdf maintains that the town has been left vague, I do not concur in this assessment: The town is sufficiently detailed for what it’s here to do – and whether they brave the frontier-style town or not, sooner or later, the PCs will have to move past the exceedingly flammable grasslands – perhaps even on the heels of yet another subtly-marked doppelgänger….and potentially on the run from Elite Klavekian Archers whose deadly prowess is far beyond the PC’s capability to survive. 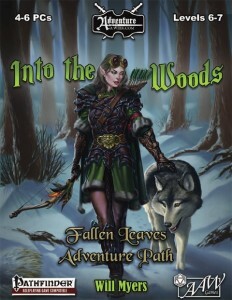 Entering the Silent Forest, the PCs, thanks to their ally, can get past the first of the elven sentries without being skewered like pincushions, but the direct negotiation with the less than friendly matriarch Haewell Birron of the elven people will require some silver tongues to make the trip to Edhellond not a short one. Speaking of which – it should be noted that GMs benefit from a lot of additional material here – Appendix B depicts Edhellond, including the full statblock of the level 20 matriarch of the vast forest in a rather nice mini-gazetteer, while another appendix depicts the elven gods in brief write-ups and the Menalpaur’s legend, in full this time around, can also be found among these pages. Even a sample card-game, Orbben, can be found among this supplemental information, lending further detail and local color to the regions visited…but back to the story. Where was I? Oh yes – a second group of drow compromises the elven safety and announces their claim to the good drow slaves – and is denied and trolls off…for now. This whole “drow intermission”-section felt jarring to me and my players – I hope there’ll be a pay-off in the future for it, because, as presented, it just made the elves look horribly incompetent. Editing and formatting are pretty good, I noticed no significant glitches. Layout adheres to a beautiful two-column full-color standard and the pdf comes fully bookmarked for your convenience. Artwork, as in most current AaW-modules, is pretty neat. If you’re expecting much cartography, though, you won’t find that – being very much a story-driven experience, there is not much here in that regard. Will Myers continues to develop his strengths as an author here alongside the themes of the AP – much like in the first Fallen Leaves-installment, this one sports quite an array of massive read-aloud texts, making this component easy for GMs not that adept at text-improvisation. Another strength of Will’s writing undoubtedly is a sense for the epic – being pretty much a free-form journey with some focus points, the first installment impressed me in this regard, while this one proved to be a tad bit more linear. In my review of Fallen Leaves Part I, I called this a heroic journey, and this genre description imho still perfectly applies to this book. We follow our heroes through intriguing vistas and pass by or explore for a bit -but ultimately, the road goes on – and this is good. However, at least to me, the whole introduction to Edhellond fell a bit flat of the intended gravitas – once again, PCs can easily be led to the most powerful matriarch; once again, magical defenses are non-existent and thus compromised…and worst of all, all happens essentially in a big cut-scene. A significant part of this module does not really have much for the PCs to do – the second half is pretty much cruise-control and, while usually they don’t mind (too) much, here, my players were annoyed – and I am inclined to agree. I love the fluff and depictions here – but why not make the PC’s actions actually matter? Provide some social interaction skill challenge? A test to prove one’s worth to be allowed to meet the matriarch and NOT die? Something like that? Essentially, I wholeheartedly urge any GM seeking to run this to add in a test and/or challenge here, unless your players are fine with well-written cutscenes. This part also ultimately constitutes a significant issue I have with this pdf – while VERY well-written and intriguing, inspired even in the fluff, this module is a bit too short on the things to actually do in my book, on the interactive aspect, if you will. Hence, my final verdict will clock in at 3 stars – a mixed bag with some brilliance, but also some significant flaws. You can get this module here on OBS!